Choosing an ice cream freezer can be a pretty daunting task. This is because online searches will invariably return results consisting almost entirely of homemade ice cream makers plus a handful of soft serve ice cream machines. The reason for this is understandable. A freezing function is an integral part of an ice cream maker and it would be impossible for the machine to make ice cream without it. This though can be frustrating is you're looking to buy a commercial-grade appliance for an ice cream shop, van or a 7-11 store. Here then is an explanation of some of the commonly used terms to help navigate the maze. These sturdy appliances are designed for commercial use. 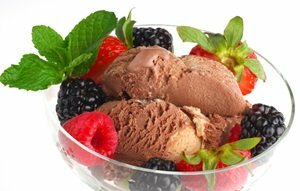 They are typically found in ice cream parlors, convenience stores and cafeterias. They are versatile and can enable the owner to retail both pre-packaged inventory and ice cream by the scoop. These freezers come in a variety of sizes with everything from compact (5.0 cu. ft) to downright humongous (30 cu. ft). In addition, you can opt for an ice cream display freezer or a solid top model. Display freezers make the ice cream more visible and aesthetically appealing so they are great for the store front. They also enable customers to browse and select the ice cream before sliding the glass door open. This helps to trap the cold into the unit, prolonging the ice cream's shelf life but also keeping a tight rein on the electric bill. Two of the popular display freezers for ice cream are the Frigidaire FCCG151FW and the Arctic Air ST15G Sliding Glass Top Freezer. Each of these models has a capacity of 14.8 cu. ft. The cabinet interior is sealed for easy cleaning and maintenance over its many years of reliable service. Homemade ice cream makers are a must-have for everyone who craves homemade made ice cream. Or exotic flavors (tree tomato, anyone?) that you would never find in a store. Plus, if you love large helpings of ice cream, whipping up your own ice cream would obviously save you money. Admittedly, you can pretty much make ice cream recipes without an appliance but if you value your time and are looking to cut down the associated tedium, a hand-crank or electric ice cream maker is a must-have for your kitchen. The manual ones are great for making frozen desserts the old fashioned way with a crank. The electric ice cream makers are able to deliver fresh and exotic confections with less sweat. The two most highly rated homemade ice cream makers are the Cuisinart ICE-21 frozen yogurt-ice cream and sherbet maker and the White Mountain F69206-X 6-quart electric ice cream freezer. Fully automatic so you can save your energy for other household chores.